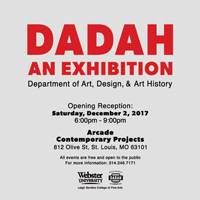 Join Webster University's department of art, design, and art history on Saturday, Dec. 2 at 6 p.m. for "DADAH AN EXHIBITION." 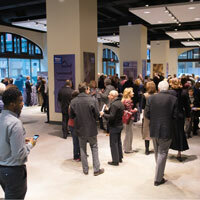 This exhibition will showcase work from faculty across the department. This Friday, April 28, offers the Webster University community a chance to see the culminating work by senior students in the Department of Art, Design & Art History (DADAH) through the annual BA Exhibition and the Art History Symposium. 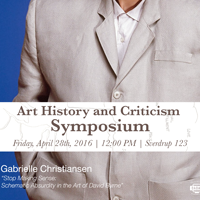 The symposium with presenter Gabrielle Christiansen will be at noon in Sverdrup 123, while the opening reception for the BA Exhibition is from 6-8 p.m. in the Hunt Gallery. 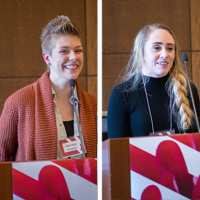 Ten Graphic Design students presented their digital and print portfolios at the annual Graphic Design Showcase on Dec. 2. Local designers, art directors and human resources representatives with an interest in design were also on hand to critique their work and answer students' questions. The showcase featured the work of Sarah Boudreau, Bridget Carey, Anna Cruzen, Jenni Fetcho, Michaela Finnerty, Jake Hunn, Eva Ju, Justin Smith, Farah Tinnemeyer and Severin Watson.